The Bureau Of Cannabis Control (October 19, 2018) The Bureau of Cannabis Control (Bureau) and the Department of Consumer Affairs’ Division of Investigation-Cannabis Enforcement Unit (DOI-CEU), in coordination with the Los Angeles Police Department (LAPD), today announced enforcement action on an unlicensed cannabis retailer operating within the city of Los Angeles. On Thursday, October 25, 2018, DOI-CEU served a search warrant on an unlicensed cannabis retail location, “One Stop Healers,” located at 14064 Foothill Boulevard, Sylmar. The City of Los Angeles confirmed this location had not applied for a local license. The LAPD assisted with the service of the search warrant. The Bureau Of Cannabis Control (October 25, 2018) Due to the large number of applications being submitted for temporary cannabis cultivation licenses, the California Department of Food and Agriculture (CDFA) hereby notifies prospective applicants that any application for a temporary license received after December 1, 2018, may NOT be processed in time for us to issue a temporary license before January 1, 2019. After December 31, 2018, the authority for CDFA to issue temporary licenses expires. To provide sufficient processing time, please submit your temporary application to CDFA’s CalCannabis Cultivation Licensing Division by December 1, 2018. MG Retailer (October 28, 2018) Co-hosted by the National Cannabis Industry Association (NCIA) and the California Cannabis Industry Association (CCIA), the California Cannabis Business Conference (CCBC) was held Monday and Tuesday at the Hilton Anaheim. The Disneyland-adjacent hotel boasts a modern, cavernous lobby and generous amenities, making it an ideal venue for the business-focused trade show, which offered cannabis exhibitors over 60,000 square feet of floor space split between two exhibit halls, with additional sponsor tables spread throughout the mezzanine level. 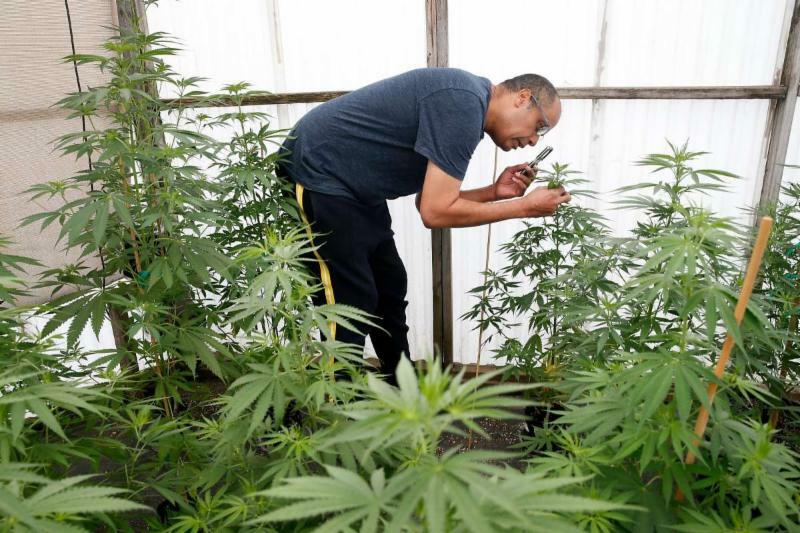 San Francisco Chronicle (October 28, 2018) Oakland’s long-touted program to help black and brown pot entrepreneurs succeed alongside bigger marijuana businesses is dead. Officially, it’s around still. But it may as well not be. The program was crafted so Oakland natives and longtime residents, especially those arrested and jailed for marijuana-related offenses during the failed war on drugs, could get a stake in the legitimized cannabis industry. For two years, the city sold a dream to hundreds of hopeful people: 616 applicants sought assistance under the equity program as of last month, city records show. The Union (October 26, 2018) State officials released late last week a final draft of regulations governing the cannabis industry, which could grant legal access to cannabis statewide despite a local jurisdiction’s say on the matter. On Tuesday, the Truckee Town Council voted to send a second letter to the Bureau of Cannabis Control with concerns that the new rules may limit local control over the industry. “The state is taking away the authority that’s been granted to our local jurisdiction,” said Mayor Carolyn Wallace Dee. ABC 7 (October 25, 2018) In rural West Petaluma, it is less a matter of “not in my backyard” as “not in my dairy cow neighborhood,” along Purvine Road. “I can smell it. I can see it.” The signs in front of Britt Christiansen’s home, and others, tell the story of a neighborhood’s suspicions about Sonoma Hills Farm, where they claim the new owners have already begun commercial cannabis operations and tours before receiving the county permit, for which they have applied. Last week, those neighbors convinced a Sonoma County judge to grant a temporary restraining order, and they filed suit against not only the farm’s owners, but also a local tour company that they say has bought busloads of people onto the property. MarketWatch (October 29, 2018) Do you take cream or sugar with your coffee? How about CBD? Cannabidiol, a chemical component of cannabis known as CBD, has been popping up at an increasing number of bars and coffee shops in major cities in recent years. Without the psychoactive components in marijuana, the substance reportedly offers some of the anti-anxiety and anti-inflammatory benefits of the drug without getting a consumer high. Until now, CBD has existed in a kind of legal gray area: In many places it is not necessarily legal, but it’s also not illegal. But this month, the passage of the 2018 Farm Bill will remove hemp and CBD from the Drug Enforcement Administration’s list of “Schedule I” controlled substances, making it an ordinary agricultural commodity and allowing it to be legally sold in all 50 states. Investopedia (October 26, 2018) In the past year, legal cannabis in North America has made significant developments. Perhaps the most important of these was the October 17 shift in Canada that saw recreational cannabis sales and use legalized for adults across the country. Even before that, though, more and more states in the U.S. have voted to legalize marijuana in one form or another, and cannabis stocks are taking off on multiple exchanges (even in spite of recent troubles). The legal marijuana industry shows great promise, with the first cannabis-based drug receiving approval by the U.S. Food and Drug Administration (FDA) and with massive amounts of investor money flowing into legal marijuana operations. WLNS 6 (October 27, 2018) Michigan State University researchers will now further their study into the effects of marijuana, after receiving more than $2 million from the National Institutes of Health. As Michiganders are getting ready to cast their ballots this upcoming Election Day, the fate of legalizing recreational marijuana is still up in the air, but that’s not stopping researchers at Michigan State University from getting a head start to see how the drug may help those with HIV. “It really takes an entire team of investigators to do this,” said Norbert Kaminski, a professor of pharmacology and toxicology at MSU. Westworld (October 29, 2018) A lawsuit filed by two Colorado landowners who claim that a nearby marijuana grow has reduced their property values in part because the smell makes horseback riding less pleasant goes to trial in Denver federal court today. And the repercussions of the suit’s strategy, based on federal racketeering laws, could have far-reaching effects on the cannabis industry in Colorado and beyond. The case was filed in February 2015 by Safe Streets Alliance, a national anti-pot group, on behalf of two members, Phillis Windy Hope Reilly and Michael P. Reilly. Early on, the effort didn’t seem particularly professional: Note that the organization misspelled marijuana as “marajuana” in its initial press release on the subject. WHEC (October 29, 2018) Medical marijuana is legal in New York State but it’s too expensive for many people who need it. Some lawmakers are working to fix that. A bill has just been introduced in the Assembly that would require state public health plans, like Medicaid and Child Health Plus, to cover the drug. Right now, most insurers won’t cover medical marijuana. That’s because of its status as a Schedule 1 drug. Lawmakers say the bill is needed to boost access to medical marijuana. Next PostCCMA Greenbrief October 30th: SF Measure Would Tax Recreational Cannabis…L.A. Continues The Fight Against Illicit Grows…CBD Market To See Bright Future In The U.S….